What Is a Circulated Coin? Circulated coins are coins that show wear because they have been used in commerce and circulated among the population. As coins are handled, tossed in money drawers, jingle in the bottom of pockets and purses, dropped on the ground and sometimes abused, each one of these instances will remove small amounts of metal from the surface of the coin. The high points of the coin are the first to wear down and will show a general lack of detail from the original design. Definitions are referenced with permission from The Official American Numismatic Association Grading Standards for United States Coins, 6th edition. When a coin first begins to show signs of handling, abrasion, or light wear, only the highest parts of the design are affected. Evidence that such a coin is not uncirculated can be seen by carefully examining the high spots for signs of a slight change in color, surface texture, or sharpness of fine details. In the early stages of wear, the highest points of design become slightly rounded or flattened, and the very fine details begin to merge in small spots. After a coin has been in circulation for a short time, the entire design and surface will show light wear. Many of the high parts will lose their sharpness, and most of the original mint luster will begin to wear away except in recessed areas. Further circulation will reduce the sharpness and relief of the entire design. High points then begin to merge with the next lower parts of the design. After the protective rim is worn away, the entire surface becomes flat, and most of the details blend together or become partially merged with the surface. Even though a coin has circulated in commerce and shown evidence of wear, it can still have a value greater than face value. Many factors determine the value of a coin, and condition or grade is one of them. Coin collectors like to have the best-preserved coins in their collections. Therefore, the demand for uncirculated coins is greater than the demand for circulated coins. This increased demand results in a lower value for circulated coins. The world is a cruel place for coins. 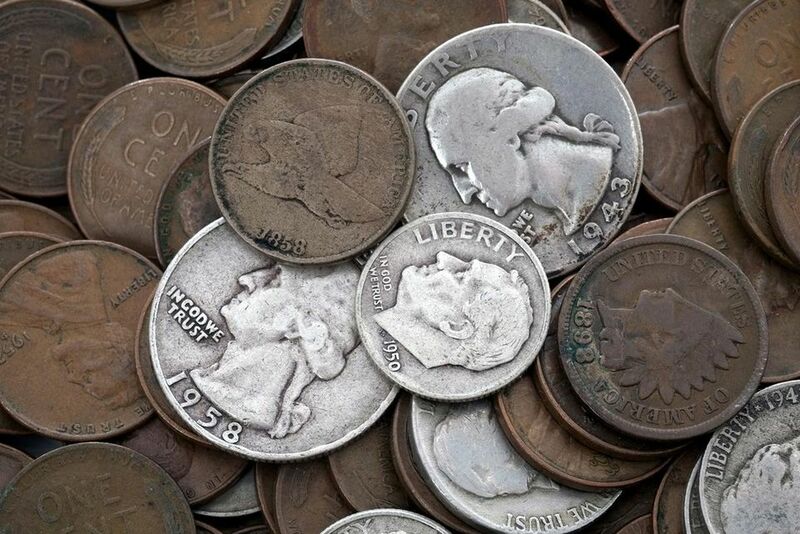 As coins circulate in commerce, they can get scratched, corroded, dinged, dented, or gouged. When this happens, the coin is considered a damaged coin. This type of damage further reduces its value from a coin without these problems. The exact reduction in value of a problem coin is difficult to determine. The longer a coin remains in circulation and is used in commerce, the greater the amount of wear will be evident on the coin. Coin collectors that cannot afford an uncirculated example of a coin will resort to purchasing a circulated example. Due to the varying degrees of wear on a coin, coins that show the least amount of wear will be more valuable than coins that are extremely worn.